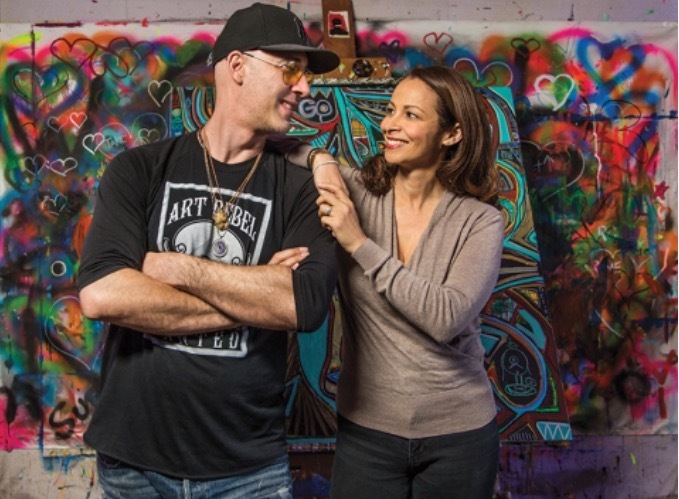 In addition to both being accomplished artists, they are now the entrepreneurs behind Art Rebel, an art community center in Sherman Oaks. From celebrities like Dave Grohl and Jessica Alba to a 94-year-old cancer patient battling the side effects of chemotherapy—all sorts of people come to the studio to experience the joys of painting. For some it’s a therapeutic outlet. For others it’s about unwinding after a hectic day at work or simply reconnecting with the creative side many of us left behind as kids. As the son of a prominent attorney, Ponti chose a “safe” career to please his parents. He worked long hours as an investment banker in London, all the while missing theater and the arts. After high school, Sabine gravitated toward art immediately. She attended the Art Institute of Chicago and began working as an artist—but then felt a calling toward alternative medicine. She left the art world and embarked on a career in London (and later LA) as a homeopathic healer. With long, stress-filled days, both Sabine and Ponti found themselves eagerly awaiting the time until they could get home and paint together. In 2008, a friend, who was a homicide detective, stopped by their house. After sharing how emotionally exhausted he was, the couple suggested he pick up a paintbrush. For the first time in 25 years, that night, the detective slept like a baby. This was the lightbulb moment that led to Art Rebel. CLICK HERE TO READ ON. by ELAINESIR April 9, 2010 September 18, 2015 .